Eudora will visit Basehor-Linwood for the second time this season, but this time a trip to the sub-state semifinals is on the line. Eudora’s Grant Elston rushed for 220 yards and four touchdowns in the game, and Travis Neis added 179 rushing yards and two touchdowns on 27 carries for the Cardinals. Eudora scored 21 points in the second quarter to lead 35-14 at halftime in the earlier meeting. Elston has led the Cardinal offense all season. The senior has rushed for 1,744 yards this season with 27 rushing touchdowns. He rushed for 227 yards and a touchdown as Eudora bested Fort Scott, 33-7 in the opening round last week. Basehor-Linwood opened the playoffs with a roller-coaster win over Louisburg. The Bobcats built a 20-7 lead before Louisburg came storming back in the second half to tie the game at 20. The two teams then traded touchdowns, but a failed two-point attempt left Basehor-Linwood with a 27-26 lead. Louisburg took a 34-27 lead early in the fourth quarter, but Austin Ettinger scored with five minutes remaining to tie the game at 34. The Bobcats then picked off a Louisburg pass and shortly after Justin Phillips hit Jahron McPherson on a touchdown pass that proved to be the difference in Basehor-Linwood’s 41-34 win. Phillips has completed 60 percent of his passes for 1,207 yards and 15 touchdowns this season. Junior Chas Rollo leads the Bobcats with 650 yards rushing and eight touchdowns, while Ettinger is second on the team with 470 yards and four scores. Phillips and McPherson have each contributed 370 rushing yards and a combined 12 touchdowns. Senior Nick Fisher leads the receiving group with 28 catches for 357 yards and four score. Jackson Brimblecom and McPherson also have more than 200 receiving yards and three receiving touchdowns each. Ryan Potter leads the Bobcat defense with 91 stops, while McPherson and Eric Scott are tops in the secondary with each interception three passes. The Bobcats must contain Elston if they want to earn a trip to the semifinals, but that is easier said than done. This marks the third straight season the teams have matched up in the playoffs and seventh since 2008, all in the quarterfinals or semifinals. Last year, Hayden won 49-19 in the 4A-I sub-state game. The Wildcats eventually took runner-up to Bishop Miege. In 2013, Buhler defeated Hayden, 27-18, en route to the state title. Hayden is sixth all-time in playoff victories with 50. Hayden has three state titles, three runner-up showings and five trips to the semifinals. Buhler has one title, in 2013, when it finished 14-0 with the 4A crown, a runner-up in 1990 and three sub-state finishes. Hayden is 4-2 all-time versus the Crusaders, according to Hayden archives. Buhler is the lone unbeaten team remaining in 4A-I with an average scoring margin of 38-12. The Crusaders stand No. 1 in the classification in defense at 118 points permitted. Hayden’s average scoring margin is 37-14. Neither team has a great strength of schedule (SOS) with No. 31 for Hayden and No. 24 for Buhler, though both have plenty of quality victories. Buhler has the two victories versus Mulvane, a 16-0 Week 1 shutout versus Andale and wins versus Augusta and against 9-1 Abilene. Hayden has defeated high-octane Andover Central in districts and Augusta. In the first round, Hayden held off defensive-minded Augusta 21-0, while Buhler had its second close victory versus Mulvane this season, 35-28. 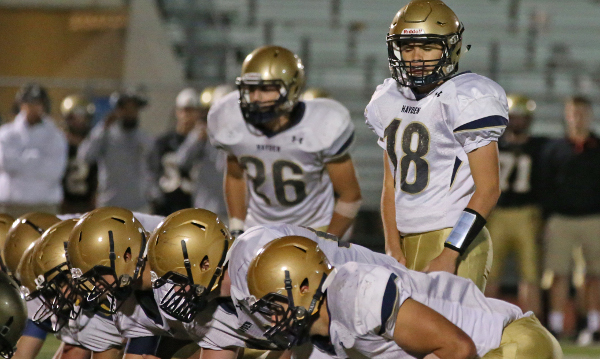 Prep Power Index lists Hayden as a 1-point favorite over Buhler. Connor Schumacher paces Hayden with 97 carries for 865 yards and 28 catches for 379 yards. He has 17 total scores, 13 rushing. Daniel Gaito has 121 carries for 693 yards and 10 scores, nine rushing. Dallas Crittenden has completed 100 of 158 passes for 1,186 yards with a 12/4 TD/INT and three rushing scores. For Buhler, Dillon Engelland has continued the line of great Crusader running backs under coach Steve Warner. He has 3,139 career rushing yards and stands top-six in rushing yards, career touchdowns, and points. This year, he has 1,429 rushing yards and 25 touchdowns. Senior quarterback Jace Williams has engineered the offense for a third straight year. This should be a classic, but Buhler’s Black Shirt defense leads the way.